Fenugreek Seeds are an ingredient in some Indian curries, used both whole and powdered in the preparation of pickles, vegetable dishes, daals, and spice mixes such as panch phoron and sambar powder. They are often roasted to reduce bitterness and enhance flavor. Fenugreek is a member of the bean family and its scientific family name is Fabaceae. Fenugreek (Methi) is used as an herb (dried or fresh leaves), spice (seeds), and vegetable (fresh leaves, sprouts, and microgreens). 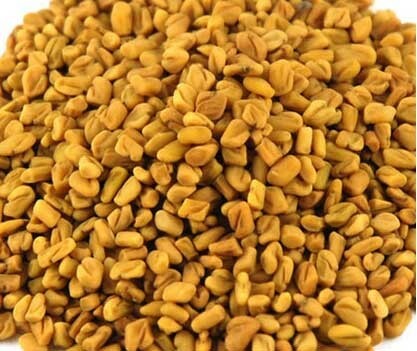 Fenugreek seeds (Methi dana) are rich sources of nutrients and dietary minerals such as iron, magnesium, manganese, and copper, as well as vitamin B6, protein, and dietary fiber. it is a popular ingredient in many North and South Indian dishes and home remedies. It is used in almost every Indian preparation be it dal, paratha or curry. Fenugreek helps to reduces risk of heart disease. Methi helps to controls blood sugar levels, diabetic must include methi (either in the form of seeds or leaves) in their diet. Fenugreek helps counter acid reflux or heartburn. Fenugreek helps you lose weight, by chewing soaked methi seeds in the morning on an empty stomach. Fenugreek is remedy for fever and sore throat, when taken with a teaspoon of lemon and honey, can work wonders to reduce fever by nourishing the body. Fenugreek seeds can help resolve hair problems, Fenugreek paste to directly apply on your hair makes your hair shiny and black. The oestrogen-like property of fenugreek can help in breast enlargement by balancing hormones in women. Fenugreek has been used traditionally by mothers to increase the production of breast milk.